Dr. Dahm is an alumnus of Chaminade High School and went on to earn a degree in Economics from University of Dayton. After taking time off to join the military, he realized he wanted to go back to school to pursue a career in dentistry. 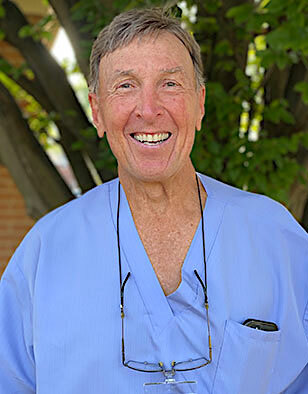 He graduated from Ohio State University College of Dentistry in 1978, and has been treating patients with his caring, gentle demeanor ever since. He believes in painless dentistry, and truly listening to his patients in order to come up with their best treatment plan. Dr. Dahm has a loving wife who you will find smiling behind the front desk at Van Buren Dental. He is the proud father of two daughters, Alex and Natalie. The entire Van Buren team were very excited to see Alex graduate from Ohio State College of Dentistry and join our team this summer! Natalie is a chef in Cincinnati, OH, creating amazing dishes at the restaurant Cinque. Dr. Dahm's other true passion is tennis, so when he is not at work, you will find him on the tennis court or traveling with the USTA Men's 65+ Team all over the world to compete. In 2014 he playing at the Men's 65+ World Tournament in Croatia and was able to bring home the Men's Doubles Gold Medal. Dr. Dahm also enjoys traveling with his wife to Naples, Florida, to spend time in the sun, enjoy the beach, and of course, play tennis. Find out what sets Van Buren Dental apart! Schedule an appointment at our Kettering, OH dental office today!